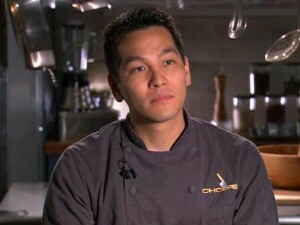 I’m addicted to “Chopped,” the Food Network cooking competition where chefs battle with culinary wits and creativity. Contestants are given a scandalously brief amount of time to concoct a three course gourmet meal with mystery ingredients such as Swiss chard, red snapper, bubble gum, and Provolone cheese. Somehow, incongruity has to end up being tasty. After each course, dishes are evaluated by celebrity chefs and one contestant is chopped. Aside from the $10,000 prize, contestants want to become Chopped Champion for the bragging rights or simply to garner the approval of their parents. The competition is fierce and cutthroat. Trash talking is encouraged and bloated egos are on display. My favorite episode ended up being a cook-off between Lance Nitahara, the chef at Camp of the Woods Resort in the Adirondacks, and Yoanne Magris, a lovely French woman who wanted to win in order to visit her dying grandmother in France. During one of the interviews, Lance winsomely talked about his faith. “Before God, I was a jerk. I was okay with stepping over people if I wanted,” he revealed. “But now, I’m able to do things with grace.” It was the first time I had heard someone mention their faith on the show. Lance’s authentic testimony of grace found itself beautifully lived out on Chopped. “What I have discovered from my faith is that it’s not about the destination, it’s about the journey,” Lance observed. “And today, the journey was great.” Amen, brother. Amen.